The good me-made news is that although I pledged to wear at least one me-made four times per week, I've actually been rocking the me-made lifestyle EVERY SINGLE DAY and managing to squeeze in a photo to boot. The bad news is my photo poses are all boring and almost all in front of the same backdrop, and I barely have anything new to show you, but, yeah, whatever. So here we go! 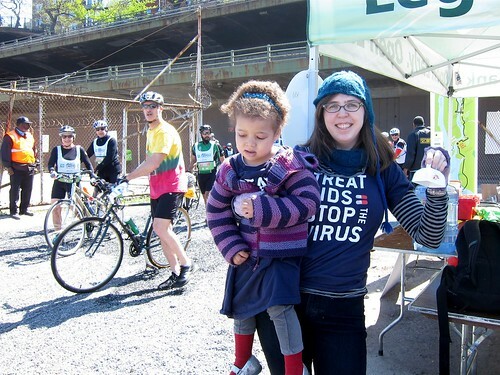 My husband was riding in the TD 5 Boro Bike Tour for Doctors Without Borders, so this outfit was all about this Doctors Without Borders T-shirt from an AIDS activism rally a few years ago. Since I was running out of me-made garments and it was super-chilly, I decided to stick to just accessories. Little Z had her Daddy's matching T-shirt and a me-made sweater. Matching alpaca hat and cowl set: 18 Seconds Until Sunrise cabled earflap hat and Cherry Garcia cabled cowl. My daughter's striped Toddler Tomten Jacket. Doctors Without Borders "TREAT AIDS = STOP THE VIRUS" T-shirt. Arcopedico Flower leather Mary Jane cut-out flats in black. Sprout eco-friendly purple watch made of Tyvek and corn plastic. I did mention I liked polka dots, right? And in case you're wondering what that odd yellow object is, it's the spacer for my daughter's daily steroid asthma inhaler. One plus to Me-Made-May is that in order to look fancy for you all I'm wearing my heels much more often than usual... Otherwise I tend to fall into a rut and just wear the same comfy flats every day until they scuff away to nothingness. Jalie Scarf-Collar top the 2nd. Brown and cream polka dot A-line skirt in cheap $2/yard poly fabric with petersham waist facing, made in 2005 pre-blog days and rather on the small side. Striped Toddler Tomten Jacket made for my daughter. Tsubo taupe leather comfy pumps with sturdy heel (similar and similarish). The OTHER side of my reversible skirt from last week. Camper Kim Mary Janes in sturdy red leather. I swear little Z isn't actually grumpy here, she was saying "soy cheese!" 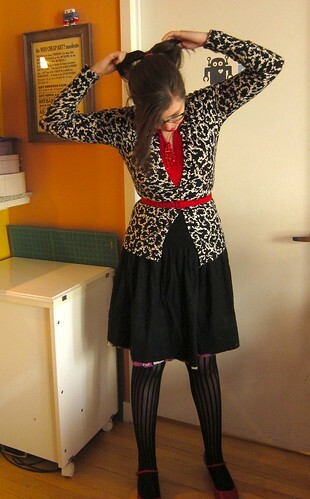 I think this might be my favorite outfit of the week (with the possibly exception of the dress from Day 10). Jalie 2921 scarf-collar floral poly knit top. Merrell "Angelic Peak" black leather near-knee-high flat boots (waterproof). The only flat knee-highish boots I've owned since 2009 and still going strong! 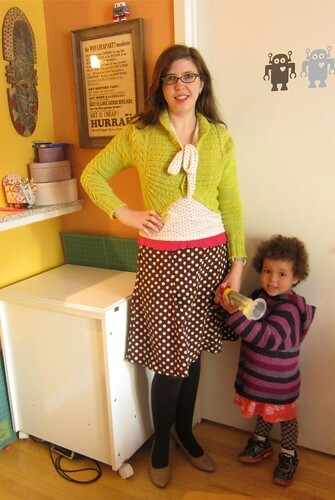 My first refashion for Me Made May! 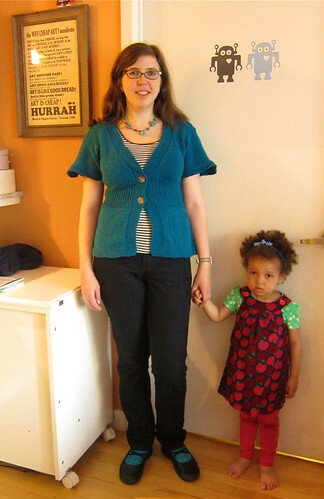 Flutter-Sleeve Cardigan with a major refashion (tutorial and details here). On my daughter: "A is for Apple" dress, now barely wearable and more of a little short tunic. I know you're sick of this dress, but until my Tiramisu one is complete, it's all I've got. Second Base Brittany demi lace cami (made in USA). 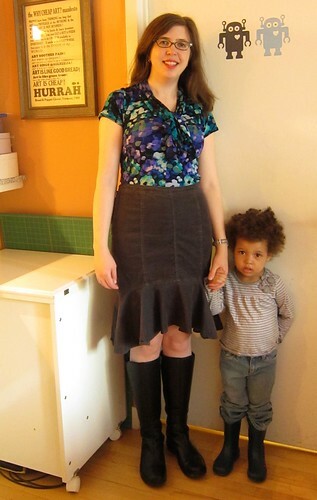 Why yes, this is a poorly-made maternity top from back in 2010, tucked in so you can't see how long/low it hangs in front. BUT at least I managed to get outside for a photo for once—I had just finished with a little printed-knit-seeking shopping excursion to Mood Fabrics with Lee. Brown and cream polka dot a-line skirt in cheap $2/yard poly fabric with a petersham waist facing... etc. Circa 2005. Never blogged. So, if you even made it to the bottom of this post, which outfit do you like best? Day 6 is my favorite! I haven't even signed up for MMM this year because I thought I'm too busy... Seeing all the pretty pics makes me a bit sad about that. I think the Jalie top is one of the best looks on you. And I adore little Z, the perfect picture sidekick! Thank you! I feel tempted to make like, four more versions of that top... maybe I will! 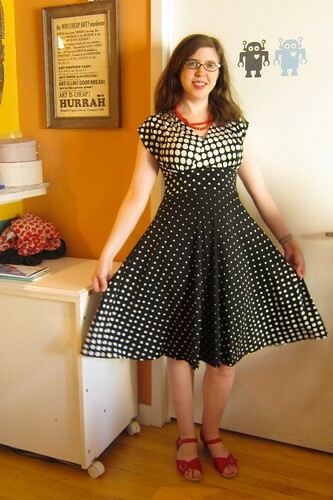 Love the polka dot dress with the different patterns, very attractive on you looks well made too. Thank you! I am super happy with how the pattern matching turned out... the construction was a little wobbly but the polka dots distract from that! My fave is day 7! I've managed to stick to my pledge of wearing one item of me made clothing everyday and take a photo everyday but I'm like you, same backdrop! There are so many things to love/be-totally-jealous-of here ... buuuut I'm gonna go with love. And only ONE of those things is that you've managed the photo part of MMM, which conquered me on day mumblemumblefourmumble. And you went to Mood. And oh my god, that child you're using to model kid's clothing -- this "daughter" prop ... she's darling! Where can I get one? Day 6 is PERFECTION. Love the polka dots paired with your cardi so much!